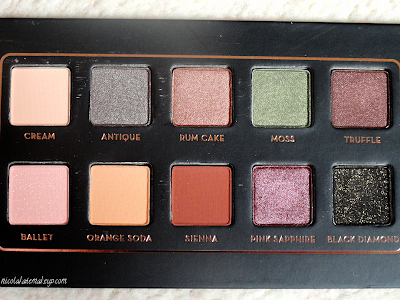 I'm always tempted to call this box a 'palette', but it's actually much more than just an eyeshadow palette. 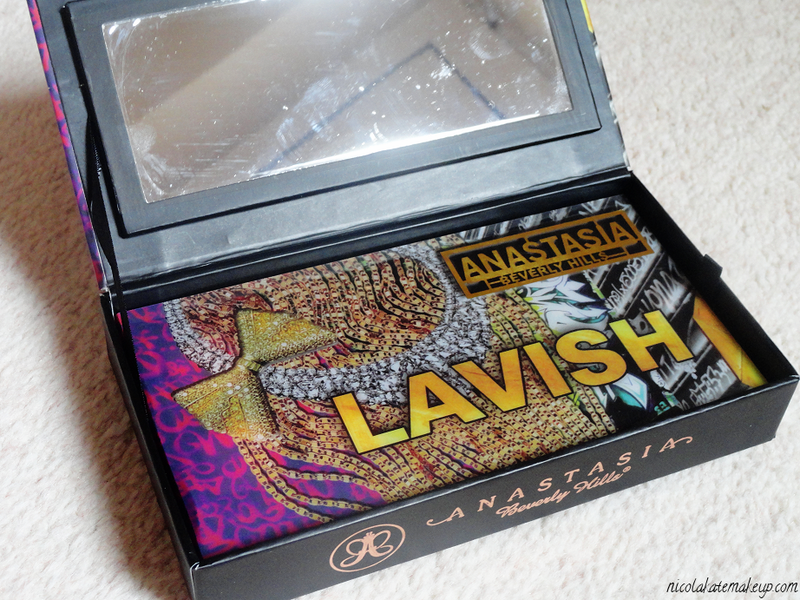 Included inside this very striking box is a booklet showcasing different step-by-step looks that can easily be created with all of the products inside and a deluxe 10-shade removable eyeshadow palette. 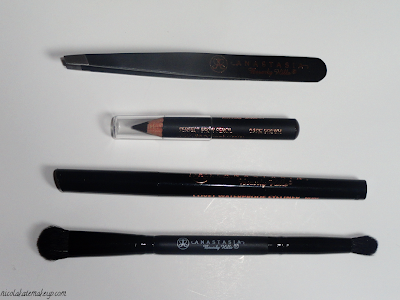 Underneath the removable palette lies more goodies including full-sized tweezers, a miniature Perfect Eyebrow Pencil in 'Dark Brown', a Covet Waterproof Eyeliner in 'Noir' and a fantastic, high quality double ended lining and blending eyeshadow brush. The Lavish kit is also completely cruelty free. The tweezers that are included in this eye and brow kit are easily some of the best tweezers I have ever owned, and now I'm starting to think how I ever lived without them. I've always preferred to pluck my brows over any other brow-grooming method, so these will undoubtedly see a lot of use from me. They have an extra-precise tip and are also brilliant at locating and removing those super annoying virtually-invisible hairs that grow on the lower half of the brow bone. Admittedly, the 'Dark Brown' Perfect Eyebrow Pencil is far to dark to use on myself, but it's still a great little item that I'm pleased to have in my kit for when I'm applying makeup on brunettes. The Covet Waterproof Eyeliner is incredibly soft and glides on with ease, also making it easy to smudge out for a more smokey effect. I wore this eyeliner along my waterline for a good majority of my day and it stayed put pretty well! It's also lovely and dark and has great pigmentation. 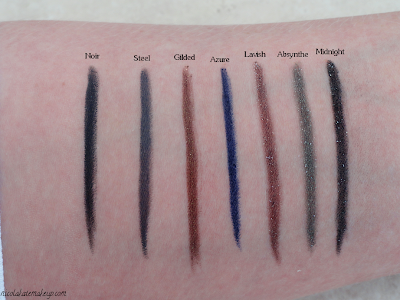 Please see a swatch for this liner further along in this post, where I will be swatching the whole Covet Waterproof Eyeliner set. The double ended professional makeup brush that is also included in this kit is of excellent quality and is beautifully soft. What I really like about this brush is that is has a multitude of uses. The blending brush effortlessly buffs out any harsh edges, just as any great blending brush should do - but I also found this side of the brush to be awesome for packing colour onto the lid. The lining end of the brush is fantastic for running a darker shadow along the upper lash line to achieve a smoked-out liner effect, but this brush is also great for smudging colour along the lower lash line, and also for other detailed work such as defining the crease. It's also small enough to add an inner corner highlighter - making it an all round brilliant multi-purpose tool. Now on to the shadows! The removable eyeshadow palette contains a selection of 10 matte, shimmery and glitter eyeshadows. The palette itself is very compact - it's shallow in depth and has a removable sleeve rather than an opening lid, making it perfect for travelling with. As you can see in the image above, all of the shadows in this palette are completely wearable resulting in them being suitable for just about anybody. There's a nice selection of neutrals, along with coloured shadows that aren't too bright or 'out-there'. 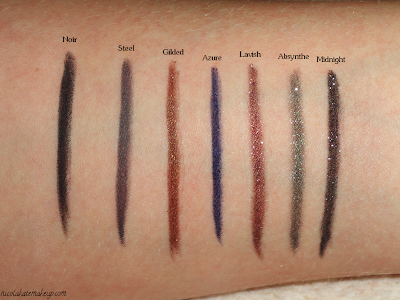 Please not that all of these eyeshadows have been swatched with the use of a base. Cream is a light matte beige and is probably the most powdery out of the whole bunch. Nonetheless, this shadow still covers well and works best on me as a soft highlight or transition colour. I also like to use this as an all-over lid colour on my 'natural' makeup days, just to help reduce some of the redness out of my eyelids and to lighten them up a little. Antique is a shimmery medium silver shadow with a slight purple undertone. I found that this shadow is much better used with some kind of silver or grey base to really bring out the lovely undertones. It feels silky and very soft to the touch, and applies smoothly, but needs a little bit of work to achieve fully opaque results. Rum Cake is a vivid, shimmery copper shade and has an even softer texture in comparison to 'Antique'. 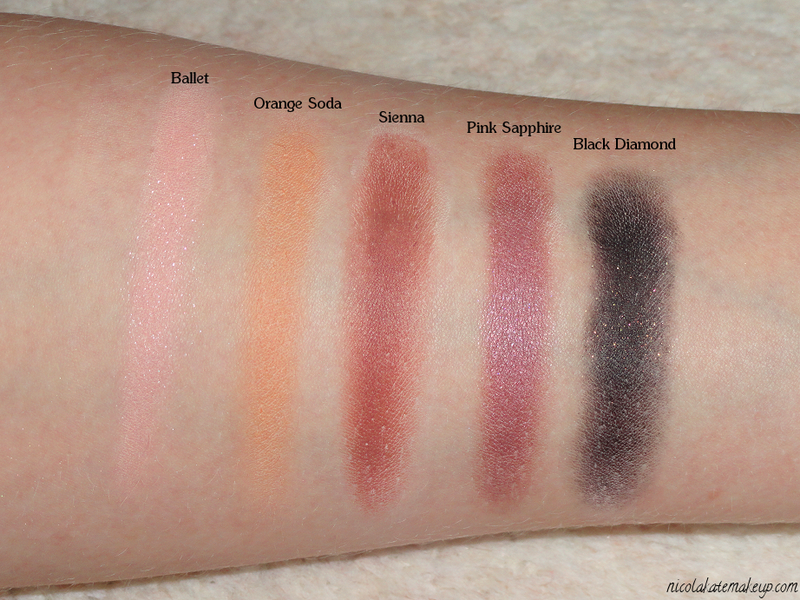 This shadow has great pigmentation and glides onto skin with ease. It blends great, and doesn't require much product to achieve an even, fully opaque finish. 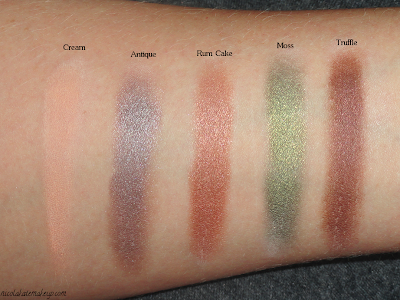 Moss is a medium green shadow with warm golden shimmers. It has pretty much the same texture and finish as 'Rum Cake', and is very silky to the touch. It applies effortlessly and has fantastic colour pay-off. Truffle is a rich, red-toned shimmery brown. Although very soft to the touch, I found that this shadow - like 'Antique' - needs some extra work and a good base to achieve a fully opaque finish. I found that this shadow works best when packed on with the brush that it included in this kit. Ballet is a matte-based pale pink with silver sparkles. Much like 'Cream' and due to it's matte base, this shadow is a little bit powdery. I found that this shade also needed a lot of layering to make the most of it's true colour, but the fact that it's a pale shadow and I'm a pale gal more than likely adds to that factor. All in all, a very pretty shadow. Orange Soda is a light matte orange shade that is soft to the touch, and a lot less powdery than 'Ballet' and 'Cream'. This shadow applies flawlessly and smoothly and blends out very nicely. I found that it didn't need a lot of work to achieve great colour pay-off, even against my fair skin. Sienna is a matte brick reddish brown. Probably one of my favourites in the whole palette. 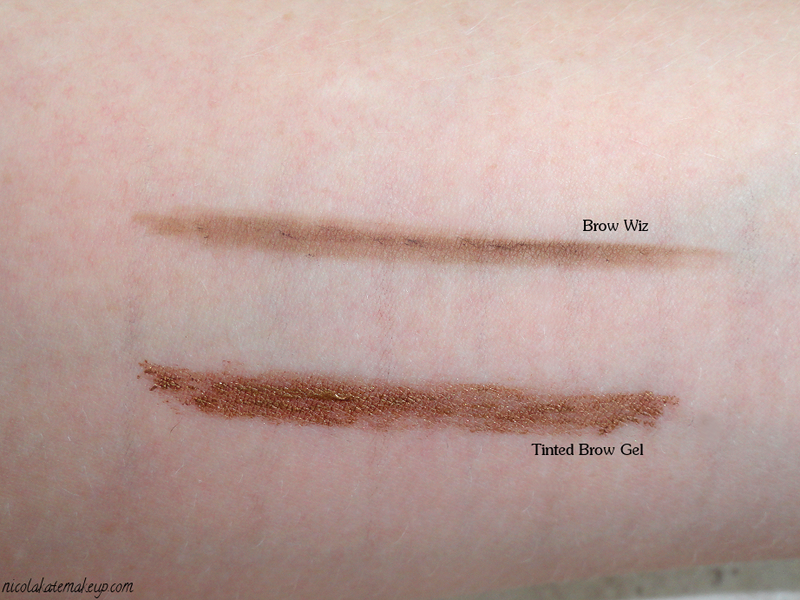 This shadow has great pigmentation, and - for a matte shadow - isn't powdery at all. 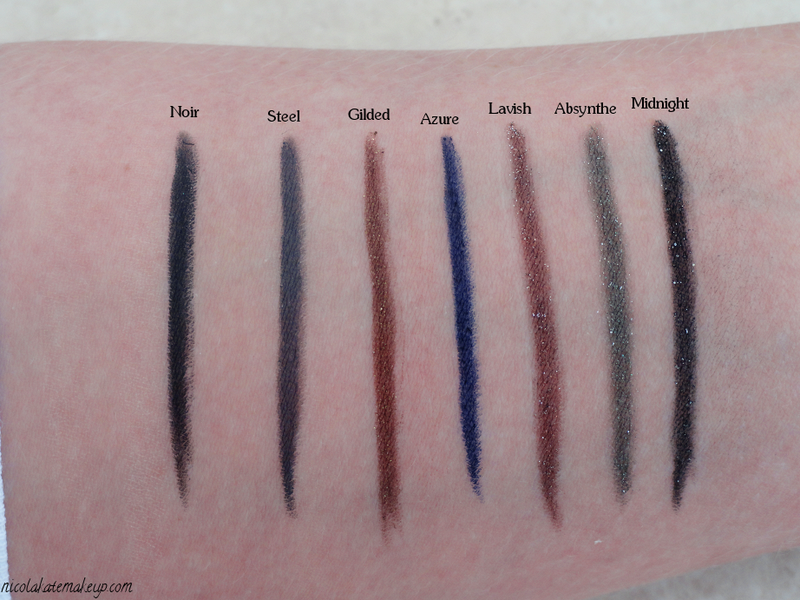 I love to use this shadow in the crease and the warm tones compliment my blue eyes well. It has a very soft texture and applies smoothly and evenly. Pink Sapphire is a warm, deepened shimmery pink. Another personal favourite of mine. I found that this shadow has great colour-pay off that blends out perfectly due to it's super-soft texture. A very pretty colour that would be suited to most eye colours. Black Diamond is a matte-based black with a variety of golden sparkles. This colour looks stunning in the pan, and it has an okay colour pay-off but not as much as I expected for a matte black. I still needed to work with it a little, but once complete it did look absolutely beautiful and exceptionally glamorous. It has a very similar texture to 'Ballet'. All-in-all, I ADORE this kit, and I've already had a lot of use out of it! It's definitely a necessity when it comes to travelling as it has all of the basic essentials a makeup addict could possibly need. 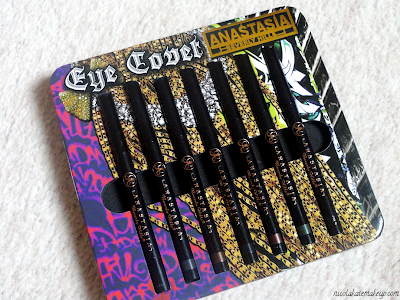 The Anastasia Beverly Hills Eye Covet Eyeliner Set comes complete with a selection of 7 cruelty-free matte and glittery twist-up eyeliners. When Anastasia Beverly Hills say 'waterproof', you can be confident feel assured in the fact that they really are waterproof. I usually have no problem with removing eyeliners with a wet-wipe, but even after swatching these I had to really work at removing them from my arm, which in my opinion, is great news. 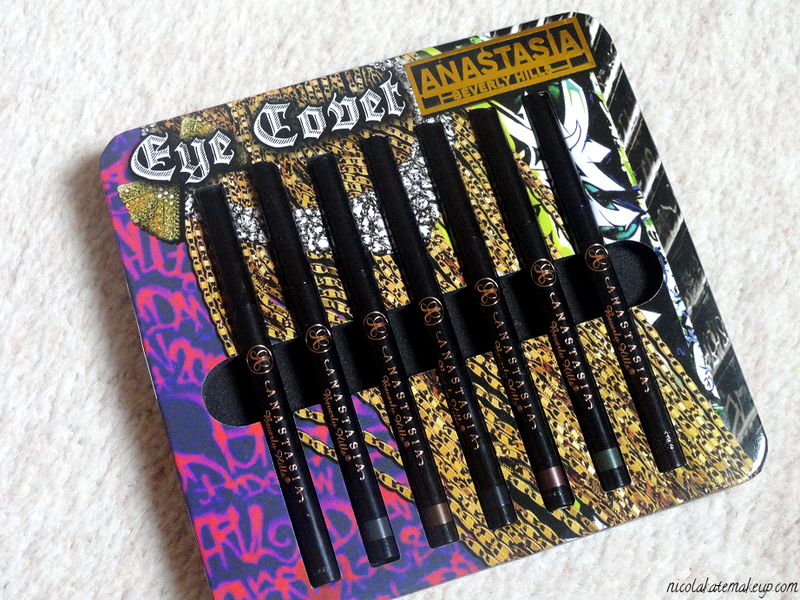 Out of the times I have used these liners, I experienced ZERO smearing or fading, even when I have applied them to my waterline. Each shade is equally pigmented, and these liners glide on with ultimate ease. 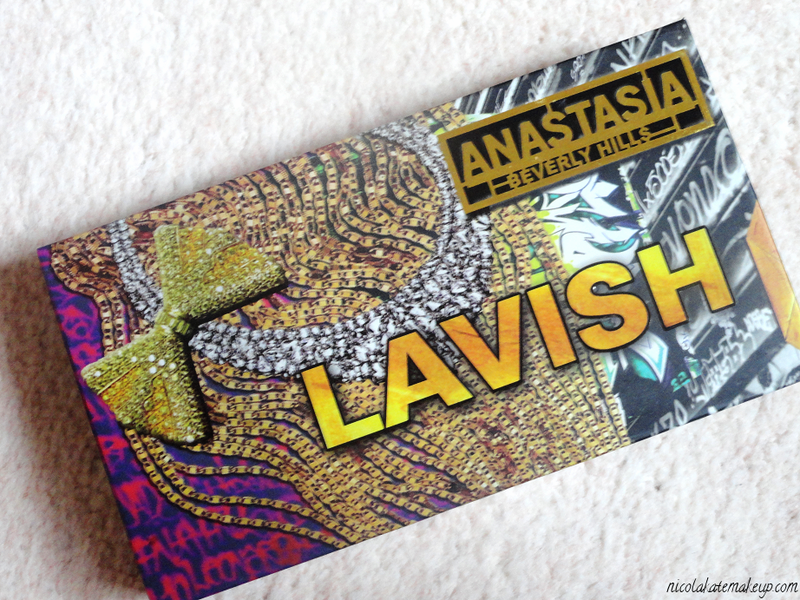 I found that they also work brilliantly as eyeshadow bases with a lot of the colours being heavily suited to the eyeshadows in the 'Lavish' kit. Noir is a matte jet black. Steel is a matte dark warm grey. Gilded is a deep golden brown with golden sparkles. Azure is a matte bright cobalt blue. Lavish is a deep coppery brown with silver sparkles. Absynthe is a medium muted green with silver sparkles. Midnight is a matte jet black with silver sparkles. 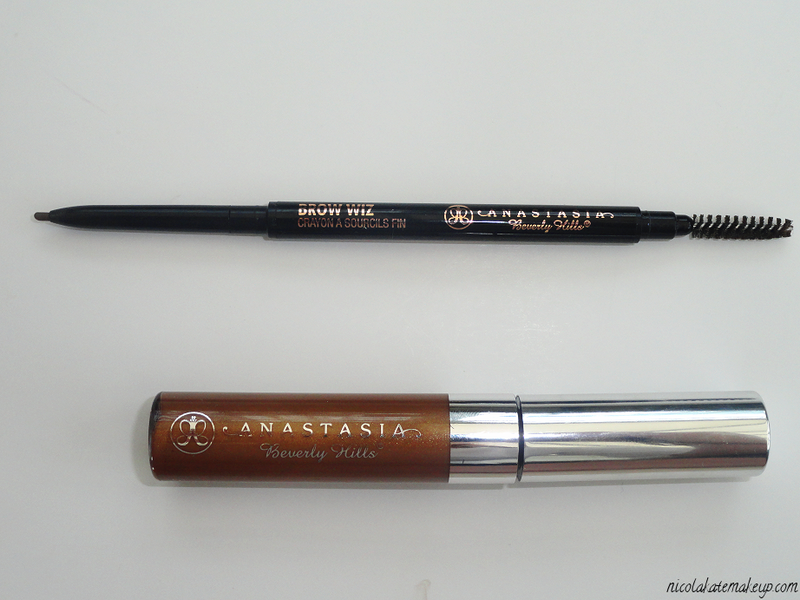 The Anastasia Beverly Hills Brow Wiz is now my holy grail when it comes to filling my fair, sparse eyebrows. After scrapping eyebrow pencils year ago due to their unnatural appearance and since favouring powders, I can now confess that I am once again an eyebrow pencil convertee, and it's all thanks to the Brow Wiz. My past experiences with brow pencils always resulted in my brows literally looking drawn on and waxy, but when following the correct directions when using the Brow Wiz, the end result is in fact, the complete opposite. The Brow Wiz is applied by using short, upward strokes following the direction of the natural hair growth, and the results are phenomenal. I am always left with fuller, natural looking brows when I use this product. I found that I only ever need to use minimal pressure when applying this products, too. Brushing through the brows with the spoolie that's included on the end of pencil ensures that everything is properly smoothed out and removes any excess product that might become attached to your natural hairs, resulting in a very polished and finished look. 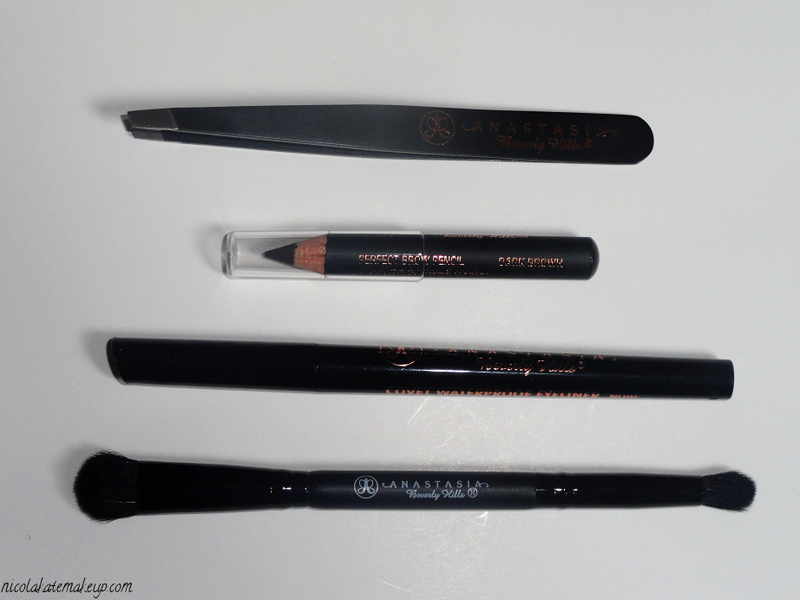 The Tinted Brow gel is also a must-have. This product keeps your brow hairs in place ALL day, and the pearlized finish provides a soft and subtle highlight to the brow hairs whilst - once again - ensuring that everything looks totally natural whilst maintaining texture to the brows. The Tinted Brow Gel is also available in these alternative shades: Auburn (for strawberry blonde to auburn hair), Blonde (for light blondes), Brunette (for light brunettes), Espresso (for dark brown to black hair) and Granite (for cool-toned brunettes). I'm ecstatic with these products and Anastasia Beverly Hills provide great products that are nothing short of top-quality and I urge you you take a look and check them out! If you would like to see me putting these products to good use, please feel free to refer to my 'Anastasia Beverly Hills' label. 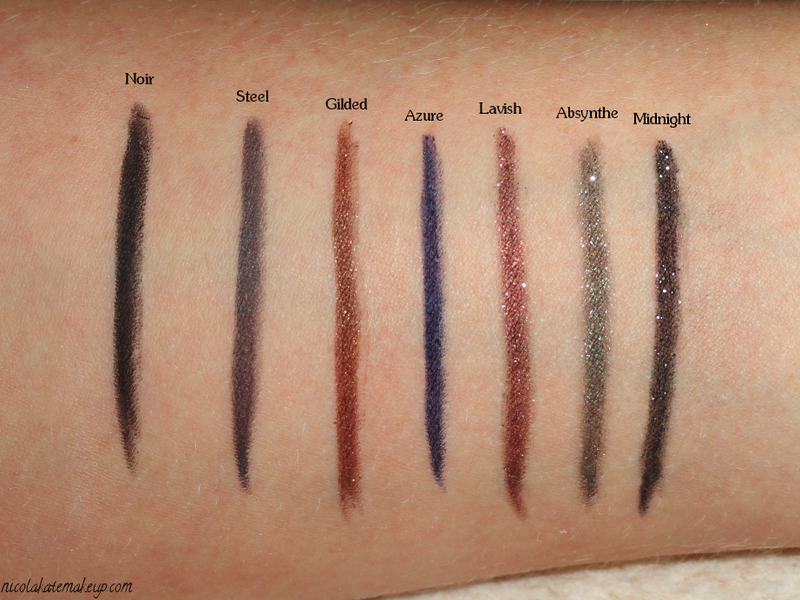 Absolutely amazing review and swatches, Nic! I love Anastasia's products as well. So lovely! Thank you, love! They really are the bomb!